I was headed to Central Park today to make some drawings but discovered the Puerto Rican Day Parade instead! What a surprise, as I had assumed the parade would be long over, but apparently there were about 25 additional floats this year, so it was still going strong in the afternoon. I made a few drawings and then I met two young ladies/artists, Myriam and Angelica, and their extended families. They wanted to draw also, so I gave them paper and pencils and we were all soon drawing like we knew how. The girls created some beautiful Father’s Day drawings for their Dads. 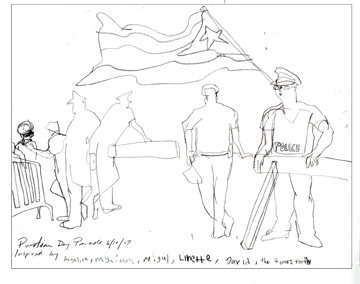 They also got in some reportage drawings of the Puerto Rican flag! Very nice, I might add. 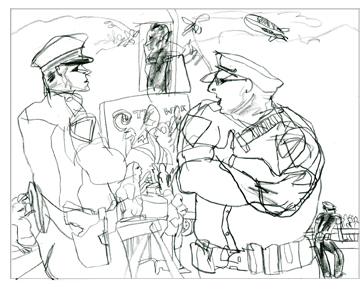 David and Linette also made some great drawings of the parade. Migul became quite good at pencil sharpening as the girls and the rest of us were wearing the points down pretty quickly! It was great fun and I promised I would put Angelica’s portrait of me and Myriam’s drawing of a bird up on my blog tonight so they could see them. As Angelica said, and wrote, on the bottom of one of my unfinished drawings, “Inspired by Angelica, Myriam, Migul, Linette, David, the Gomez Family”. They were very, very inspiring and I was happy I met them all! 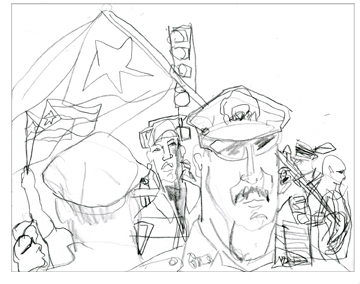 Wow – it’s like Picasso did some etchings of the Puerto Rican Day Parade, but it’s Margaret. Beautiful design and character! What was Eddie doing there (first one – hee hee)? It does look like Eddie! I didn’t see that til you pointed it out! What a great compliment – me and Picasso in the same sentence! As I live and breath.